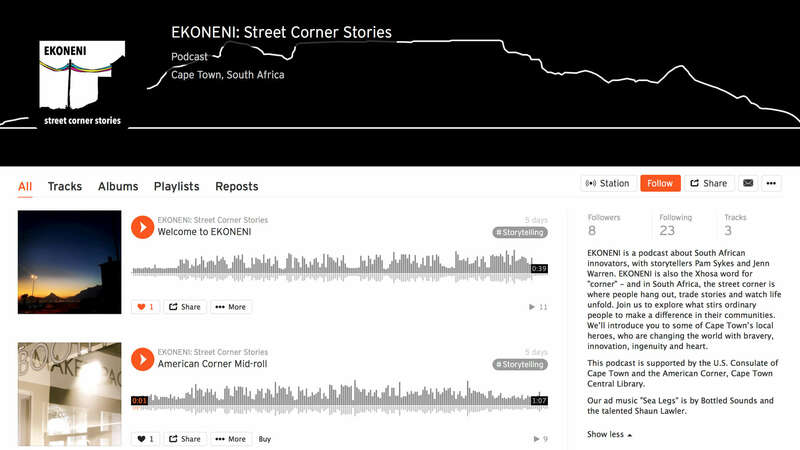 Ekoneni is a podcast about South African innovators, by storytellers Pam Sykes and Jenn Warren. Ekoneni is also the Xhosa word for "corner" - and in South Africa, the street corner is where people hang out, trade stories and watch life unfold. Join us to explore what stirs ordinary people to make a difference in their communities. We’ll introduce you to some of Cape Town’s local heroes, who are changing the world with bravery, innovation, ingenuity and heart. This podcast is supported by the U.S. Consulate of Cape Town and the American Corner, Cape Town Central Library. Ad music courtesy of Bottled Sounds and Shaun Lawler. Follow us on iTunes, or wherever you listen to podcasts.